If you have ever been in a desperate situation then maybe you can relate to this story recorded by Matthew. 25 The woman came and knelt before him, “Lord, help me!” she said. 27 “Yes, Lord,” she said, “but even the dogs eat the crumbs that fall from their masters’ table.” 28 Then Jesus answered, “Woman, you have great faith! Your request is granted.” And her daughter was healed from that very hour. It always upset me the way Jesus treated this woman. Why would he ignore her, tell her she is not important and then call her a dog? From what I know of Jesus this is out of character! Leaving the place – He was at the Sea of Galilee and walked 30 miles or more to the region of Tyre and Sidon on the Mediterranean. Jerusalem was 75 miles south of Galilee. Jesus was in good shape. Citrus Heights to Davis is 30 miles. Here to Vallejo is 73 miles. The region of Tyre and Sidon – Tyre had an illustrious history. Established as early as 2700BC the city was two halves. One on the mainland and the other was on an island about a half-mile offshore. It was well known for lumber, its purple dye and bronze work. A river separated Tyre from Sidon about 20 miles north. It was a prosperous but pagan land. The Island of Tyre was well fortified and the citizens enjoyed a rather safe existence. Though the region changed kingdoms often and the city had been under siege several times the island had never been taken until Alexander the Great around 332BC. He was so determined to take the island that he built a causeway and after seven months of siege he entered the city and killed about 7,000 armed men of the 40,000 inhabitants. When the Israelites entered the land they were given the order to destroy and drive out the inhabitants. They found it a pretty difficult task especially the outlying areas. Tyre is in the territory of Asher and was one of the northern most cities in Israel. By the time of Jesus Israel had gone through some difficult times being conquered by many nations and now was under the Romans. This region could be a place of deep resentment to the Jewish nation for having such a large gentile populous. A Canaanite woman – She was a descendant of Ham the cursed son of Noah. It could also have been used as a generic term for a Gentile. The Bible doesn’t give us any more detail about her. Was she young or old? She could have been very wealthy and influential or the wife of a lumberjack. She could have worshiped their god Baal or maybe she feared God. What kind of woman was she? I think for the purpose of this story she represents all of us. Crying out – desperation, anxiety, fear for her child! A need for a solution! Lord, Son of David – Lord means one possessing complete control. It denotes a master of slaves and a ruler of his subjects. The title, “Son of David” was a popular name for the Messiah. God promised David that there would always be one to sit on his thrown. The Jews were looking for the Messiah. Messiah means anointed one. There were three sets of people that were anointed with oil for duty in Israel; Kings, prophets and priests. Jesus was all three. She called Him by His proper title, an act of humility, reverence, respect and surrender! Have mercy – Dictionary: compassion or forgiveness shown toward someone whom it is within one’s power to punish or harm. Easton: compassion for the miserable (or those in misery). Comes from knowledge of ones condition. NOTE: Mercy-seat: means covering and refers to the lid of the Ark of the Covenant that sits in the Holy of Holies. Once a year the High Priest would sprinkle blood from the sacrifice onto the Mercy-seat to purify Israel from their sins. 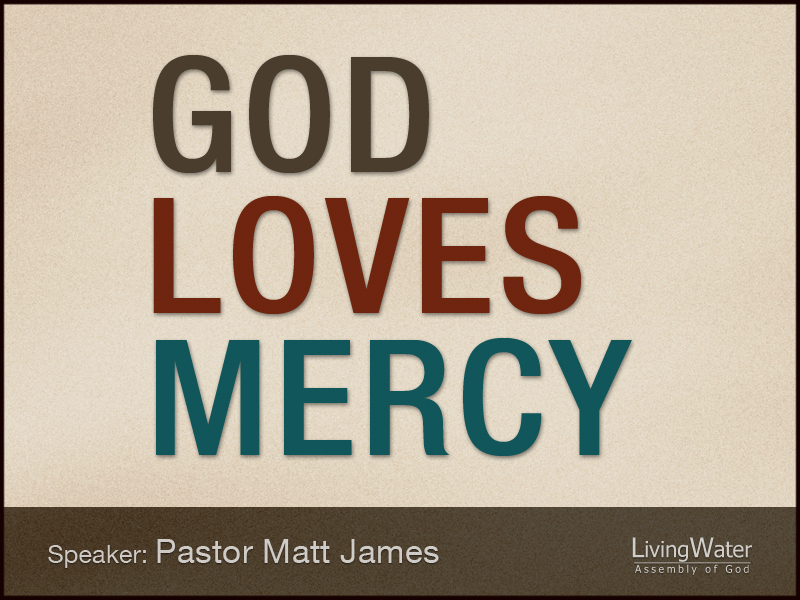 GOD LOVES MERCY! We need to examine her situation. If you have ever seen your child hurt you can relate. If you have any compassion in your heart toward others especially toward hurting children then you would be moved by this mother’s determination and humility. Grasp the desperation of this woman. I’m down on my knees again tonight. ?I’m hoping this prayer will turn out right. ?See there is a boy that needs Your help. ?I’ve done all that I can do myself. ?His mother is tired, ?I’m sure You can understand. ?Each night as he sleeps ?She goes in to hold his hand. ?And she tries not to cry ?As the tears fill her eyes. CHORUS: ?Can You hear me? ?Am I getting through tonight? ?Can You see him? ?Can You make him feel all right? ?If You can hear me, ?Let me take his place somehow. ?See, he’s not just anyone ?He’s my son. My daughter is suffering from demon-possession – Her daughter is under the control of a demon. Possession means to have or to own, to have the control. The demon had possession of her mind and body. She was in great anguish. The Bible gives us a few encounters of demon-possessed people. Mark 5:1 They went across the lake to the region of the Gerasenes. 2 When Jesus got out of the boat, a man with an evil spirit came from the tombs to meet him. 3 This man lived in the tombs, and no one could bind him any more, not even with a chain. 4 For he had often been chained hand and foot, but he tore the chains apart and broke the irons on his feet. No one was strong enough to subdue him. 5 Night and day among the tombs and in the hills he would cry out and cut himself with stones. There are other portions of scripture that point out the state of humans who have been possessed. Some were mute, others were stricken with seizures and some would be cast into fire by those demons. Jesus cast out all these demons and healed the people. Daemon: the Greek form, rendered “devil” in the Authorized Version of the New Testament. Daemons are spoken of as spiritual beings (Matt. 8:16; 10:1; 12:43-45) at enmity with God, and as having a certain power over man (James 2:19; Rev. 16:14). They recognize our Lord as the Son of God (Matt. 8:20; Luke 4:41). They belong to the number of those angels that “kept not their first estate,” “unclean spirits,” “fallen angels,” the angels of the devil (Matt. 25:41; Rev. 12:7-9). They are the “principalities and powers” against which we must “wrestle” (Eph. 6:12). This mother is willing to do anything to help her child from this evil. The necessity for mercy stems from the condition of her child. We don’t know how she became demon-possessed, the issue wasn’t even discussed, the point was that she needed mercy! Maybe this woman, being a Canaanite had tried giving sacrifices to Baal if that was her god. Maybe she had gone to doctors and experts but no one could help. She probably had spent countless hours taking care of her and whatever money she had she gave to cast out the demon. The status of this woman has no bearing on the level of humility she is willing to endure for her child. That’s good love. Jesus just kept walking and ignored her. Like she was unnoticed and unimportant. Maybe a nuisance to them all. The disciples tried to get rid of her because she kept following them and interrupting the conversation. Maybe they thought Jesus was too busy. But she kept persisting! She refused to go away! The audience was always important to Jesus. When his disciples approached him he said he was only sent to the lost sheep of Israel. He said it loud enough for people to hear including the woman. Sheep: this is a loving term used throughout scripture to depict the relationship of the True Shepherd and His sheep; God’s care and guidance for the Israelites. The entire Jewish community was intently curious about Jesus. There were scribes, Pharisees and Sadducees, priests and common Israelites all in attendance including gentiles. Everywhere Jesus went crowds of people swarmed him to hear his teachings and see the miracles. Jews and gentiles alike came to see him. People all over the nation had heard about this Jesus that heals the sick, feeds the thousands, refutes the Religions and spends his time with the sinners. NOW: This Jesus was up in her neighborhood. Nearly 100 miles away from Jerusalem. This might be her only chance to save her child. Maybe she heard about the Samaritan woman at the well or the gentile soldier whose servant Jesus healed. Maybe he would show the same kind of compassion for her child. Maybe she thought that he was her last resort. Jesus was coming her way and she didn’t know if he would ever be back. The time to act is now! She knelt before him- Lord, help me! Jesus responds in a harsh way again! He can’t give the children’s bread to the dogs. The children’s bread – again Jesus is indicating how precious his children are to him. What man gives his children’s food to the dogs? Jesus is the bread of life and he intends to feed his children the Word of Truth that sets men free! God had been investing His love in His children since Abraham (since Adam, even before time) and he wasn’t about to stop now! Men don’t live on bread alone but on every word that comes from the mouth of God. Jesus is the bread of Heaven that gives life and it was time for his children to receive that life! He can’t give it to the dogs! By now wouldn’t you think she would have gone away downcast? Insulted in front of everyone. Pushed to the side like a dog. Isn’t it time to give up and accept the condition of her child? ……… Her child! That was her child! And Jesus is here and listening! What is Jesus trying to say? That she is a dog? That she was just a pet in the family? When she replied to this lowest blow to her ego she consented that she didn’t belong to God’s family and compared to the holiness of Jesus and his children she was nothing but a dog. In verse 27 she addresses him by the word “master”, “but even the dogs eat the crumbs that fall from their masters table.” She is acknowledging his authority and his goodness. A good master lets the dogs eat too. He is not abusive, HE is compassionate. Can I just have a crumb of bread? The ones that fall off the table. Even a crumb from your table is enough to heal my child. Other than food for eating there is another use for bread at the banquets of those times. In the more noble homes during a banquet the guests are seated at the table, the Master of the banquet closes the doors himself after all the guests have arrived. During the banquet bread was often used to clean the hands of those at the table. The crumbs fell or were brushed off the table to the ground where the dogs ate those crumbs. Here in the region of Tyre and Sidon Jesus called for a banquet. By this woman’s desperate plea for mercy he brought everyone inside and sat them all down at the table to teach them the will of God. He fed them the living bread and extended his mercy to those who seek him. By the hands of Christ nailed to the cross he shut the door on sin and death and his mercy is extended to all who believe, all who seek him, and all by faith in Christ are called Children of God. You have great faith – without faith it is impossible to please God. But with faith and with God’s Spirit we are able to humble ourselves to God’s will. By faith we are able to receive God’s mercy. Many people have too much pride to surrender their lives to God. But because of the condition of our souls and the sinfulness of our hearts there is only One way to God. It’s not because God wants to control people that God made Jesus the only salvation, it is because of the goodness of God that He shows us His mercy through Jesus. We are healed because He is merciful. The altar: if there is something in your life that needs the mercy of God over, stand or even come to the altar. It signifies that we are moving from where we are to where God is. We are seeking God for a change in our lives. We are crying out to Jesus for his mercy. We are going to the cross the mercy-seat of God. Where the sacrifice of God was made for our redemption. God loves giving His mercy to His children. He sends it from Heaven like rain. He loves to give His mercy! If you’re looking for God’s mercy in something continue to seek him.